1. Do you need to brush up your grammar skills? 2. All children have a sweet tooth! Don’t you? Do you like cupcakes? 3. How about mixing grammar with making cupcakes and have some fun? Suppose your 3rd grade English teacher assigned you a very long homework from the chapter about nouns. It seems like it will take you ages to finish it! You might find it hard to decide whether ‘money’ is singular or plural. Or maybe you cannot believe that ‘mouses’ is NOT the plural of ‘mouse’. In the meantime, your mom is baking cupcakes for your birthday party. How enticing the aroma coming from the kitchen is! I wonder what flavors, colors, and decorations there will be this time. After all, each kid has a sweet tooth; you are no exception! Too bad you promised mom to not leave your room until the assignment is done! You are longing to finish, so you can run to the kitchen and grab a cupcake (or two, or three)?! But … you learned from your heroes always to be true to your promises and never to leave a mission unfinished. However, the smell from the kitchen is sooo yummy! And the homework sooooo long!!! Wait a minute: there is a solution! There is this new thing called the Dacobots portal. 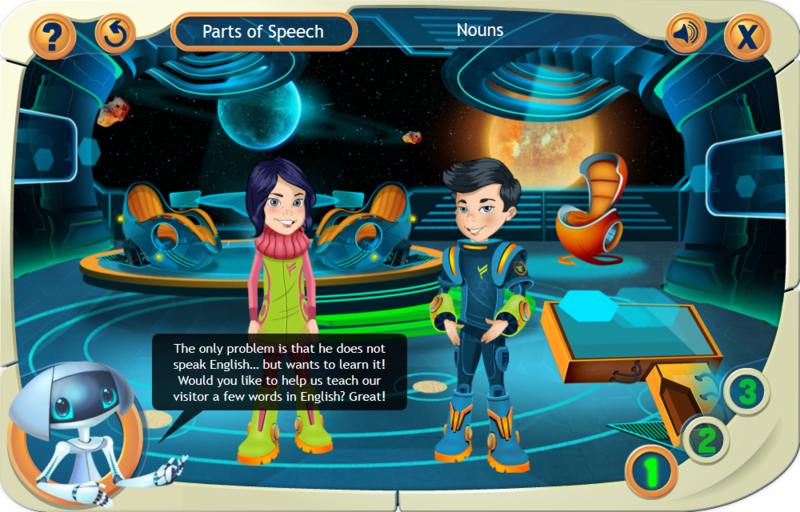 It is an elearning portal for kids that has a series of educational games called “Parts of Speech”, which can help you brush up your grammar skills in a jiffy. These funny and exciting games stick to one topic at a time. An avatar (coming from outer space!) shows you the grammar rules in the first section of the game and helps you out during the drill & practice sections. The best part about these elearning games is that they tell a story which is meaningful to you. It is about two children astronauts, Mike and his sister, Jane, who are guided by the robot DERZELIS on their space adventures. An alien landed on Mike & Jane’s planet because his spacecraft had broken. The alien now feels lonely because he doesn’t speak any terrestrial language. With DERZELIS’ guidance, Mike and Jane decide to make him more welcome on Earth. They want to throw a cupcake party in the alien’s honor and teach him a few English words. During the first section of the game, DERZELIS offers everybody a quick intro on the world of English nouns. Loaded with information, the team starts planning the cupcake party during the second section. Will you join in the preparations? If you’re ready to lend a hand, you can start by placing the cupcakes on the plates. Match the cupcakes to the plates, and the nouns to their plural forms! Next, the astronauts have to ornate cupcakes! Each cupcake matches a noun, and each decoration matches a plural suffix. To make some space-licious cupcakes (i.e. 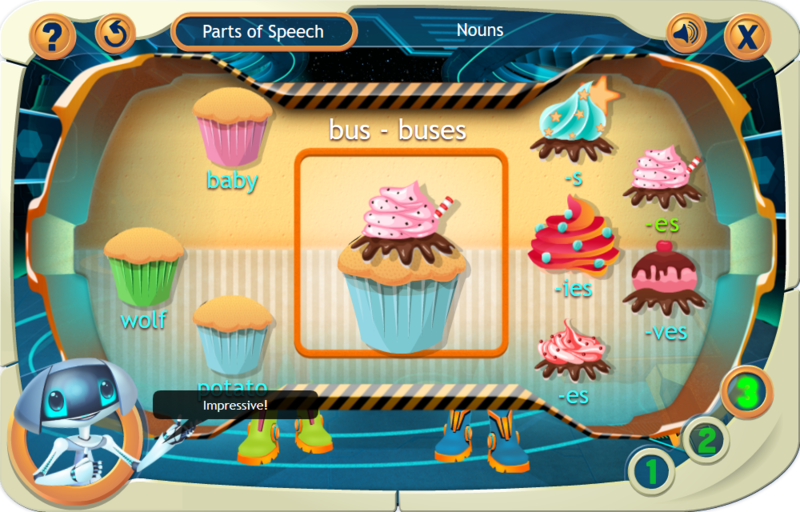 plural nouns), they need to combine each cupcake with the suitable decoration. The astronauts need any help they can get because the party is about to start. They are running out of time, so they only have 5 secs per cupcake. In the end, all your efforts will be rewarded with a card showing a yummy cupcake. Moreover, you’ll be proud that your knowledge about nouns helped out an extraterrestrial feel welcome at a super cupcake party! Not to mention that you can now finish your homework! Now, go grab that real cupcake! You deserve it! Ready to explore some more elearning games? 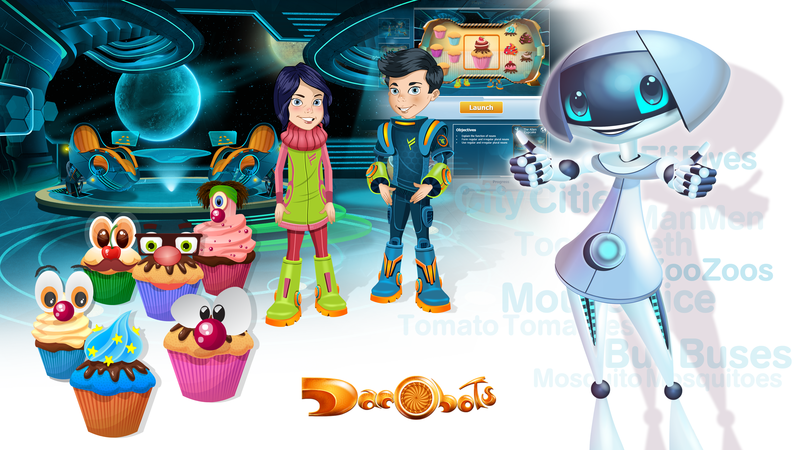 Check out the Parts of Speech Series on the Dacobots Portal.